What a year it's been for Aubrey in her first year in Montessori. We've seen her absolutely flourish. She draws with a purpose. While it looks like a scribble- she knows want she wants to draw and she tries to do it. She has mastered polishing wood, silver and brass. She glues shapes. She cuts them out and glues them down. She's mastered sequencing and patterns. She's great at classifying. She can classify what is magnetic and what's not. She loves chores. Sweeping, wiping spills, mopping. She knows all the months in the calendar year. She's mastered apple coring and after she cores it, she serves it to her friends. If they've already touched one, she has them take the one they touched. So cute. She serves her friends lemon water. She's had many vocabulary explosions. When we go through the picture dictionary with her, she's able to identify most of the things in there and her sentence structure continues to improve. Potty training- That was THE discussion. She celebrates being dry. Apparently at school, they have her pretty potty trained. She tells them when she needs to go, etc. 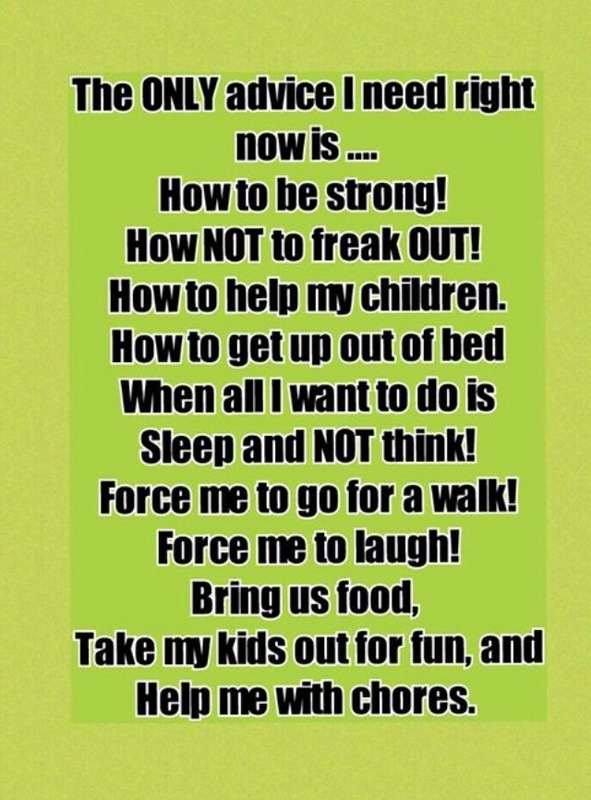 So now we need to encourage her at home and explain why we need her to do it. We've tried at home before and she pees pretty much immediately, so I dropped it. I guess I need to try again. What a gorgeous weekend we had! We a blast celebrating Aubrey's 3rd Easter with our family. Friday, Scott and I both worked and Aubrey's school was closed, so she stayed with my mom and her cousins came over and they just played together. My mom set up a cute Easter Egg Hunt for them. Saturday morning, Scott and Aubrey worked in the yard. They are so cute together. For Christmas, my mom got Aubrey a watering can, a little wheelbarrow and some planting tools, so she goes out to help Scott plant and prune, water plants and pick up leaves. It was so pretty outside, Scott thought it would be a good idea to grab lunch out on a patio....can't beat good food and a fun atmosphere on a gorgeous day. So we invited Scott's parents and met at Cottonwood. It's in the Heights, and during the day, is a great place where both children and adults can have a great time. People bring their dogs there, bands play, there are bean bags to toss and other games. It's just fun. They have yummy adult drinks there, a delicious grilled cheese for the kids, and a delicious burger with the most divine bacon jam. Plus, it's not in the neighborhood, so it was fun to kinda go somewhere that's not a regular place for us. With Easter being the next day, we called it a day after that, took Aubrey home for a very late nap, and just made a pizza for dinner and stayed in the rest of the evening and even went to bed early. Sunday, we woke up early and Scott made cinnamon roles for breakfast and we gave Aubrey her Easter basket. We are fast paced at our house so we had to jet to 9:00 Easter Mass but we made it! We came home and had Aubrey hunt for Easter eggs, which she absolutely LOVED! My sister spent the day with her in laws and my dad was working, so for lunch we had my mom over and just set out appetizers, relaxed, my mom brought over an Easter egg dying kit, so we did that which Aubrey was fascinated by, we played with play doh, and just kinda hung out doing kid stuff and relaxing. For dinner, we headed to Scott's parents for The.Best.Barbecue.Ever. My father-in-law knows bbq. It's better than anything else I've ever had at any restaurant. He does these ribs that are just ridiculously amazing. They are sticky and fall of the bone with a sweet heat flavor. I ate every piece of meat I could from that bone. He did chicken the same way, kinda like a sweet heat flavor, it was last meal worthy. Scott's mom sealed the deal with it being the best BBQ Dinner EVER because she made her famous/always requested/never can be imitated Potatoes Au Gratin and yummy cupcakes with sparkly pink icing for Aubrey for dessert. Scott and his brother went to putt at the neighborhood golf course, so I got to have girl talk and catch up with Scott's mom over her freshly made Sangria! Speaking of Blaine in Aubrey....a little throwback picture. How cute is my baby Aubrey with Blaine. We chatted some after dinner and headed home to get ready for the week, but ended up all going to bed immediately. Scott got some encouraging news this week, so Friday night we used it as an excuse for a celebration and went to dinner at Pappasitos. I absolutely love their queso and their Chipotle Glazed Salmon is absolutely TO DIE FOR. Not even kidding. If you love fish or salmon- it's a must order. And if you don't love fish or salmon it's still a must order because it's just that good! It's worth going to Pappasitos just for the sweet heat glaze the salmon is topped with. I always order grilled veggies on the side instead of rice and pour some of the sweet heat over the veggies. 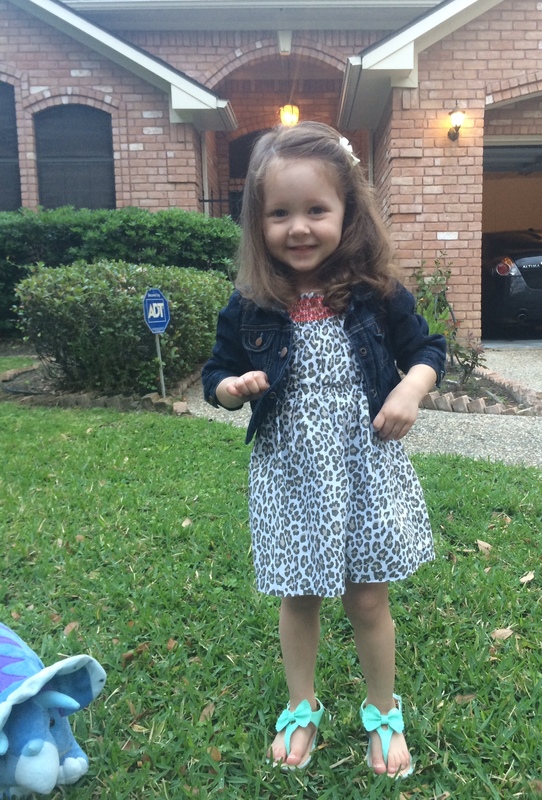 How cute is our little girl before dinner. My husband dressed her from head to toe too. She's almost 2 1/2 and this dress is 18 months. Aubrey can be tricky to dress....she's tall enough for 3 year old pants, but they fall off of her...18 month pants fit her tiny waist, but are just way too short. I thought Scott nailed it with this little outfit and I love how he added the denim jacket. Target has the cutest sandals for toddlers so I snagged these gorgeous mint ones a couple of weeks ago. Saturday morning, we went to our sweet friend Viola's birthday party. I wish I would have taken pictures of the décor because everything looked strait out of Pinterest or a party blog. It was the cutest Cowgirl theme. They did wagon rides for the kids, which I thought was so neat and Aubrey just loved, and they did a fun piñata and pin the tail on the donkey. It was so fun to watch the children enjoy the same games I did as a child. After the piñata was busted open, Aubrey for some reason just cared about the Tootsie Pops, and collected each and every one of them as fast as she could, and held on to them like they were a bouquet of flowers. Silly girl. She didn't want to leave but we had to leave early. Later that afternoon, I headed to a makeup lesson to learn about highlight, contour and different eyeshadow techniques. It was a great lesson and I learned some helpful tips. I was worn out after that so that night we just relaxed. Sunday, Scott turned in to a plumber. I always knew he was good at a lot of stuff, but Sunday he really impressed me. The bathtub's faucet wouldn't really shut off- it kept streaming water. He watched a YouTube video and decided to tackle it himself and at first, made it worse. Hot, hot water was coming up through the knob of the tub and gushing through the faucet, and would not turn off. After a lot of trial and error, he figured out how to turn the main water line off to the house so that he could stop the madness. I asked if we should call a plumber- I mean somehow we needed to fix the tub and get the water turned back on. He kinda thought about it- said maybe but to hold off. He watched some more YouTube and ran to Home Depot for supplies, came back and fixed the tub. Probably saved us hundreds of dollars too! After that whole fiasco we went to a park, then came back and Scott made an easy/quick dinner and we were able to relax the rest of the evening. We are back to gymnastics this week, after last week's Spring Break. Hope everyone has a great week! Winter was mild and we've been feeling the heat in Houston since well, last Summer. With Spring finally here, I've been melting, (no pun intended) to get my shopping on for Summer essentials and be outdoors in our gorgeous weather. I don't give our daughter a ton of candy and for Easter I didn't want to give too many Easterish themed things, because well, they are out of season in like a day. Here is a picture of our daughter's Easter basket from last year. I'll put a few eggs in the Easter basket, and she will hunt for the rest. 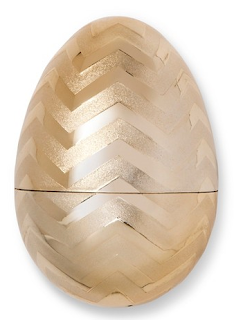 I'll also include one golden egg that I got at Target for $3, http://www.target.com/.../jumbo-6-golden.../-/A-50106248. This year, this is the Easter egg that will have the candy treats in it....for the rest of the eggs, we will just do goldfish and craisins in the other eggs. As our daughter get's older, the golden egg will continue to be the "special exciting egg" and we can do like cash or a piece of jewelry in it. For books, I really like the Velveteen Rabbit and Peter Pan. They aren't too Easter themed, so they can be enjoyed and read all year long, but still have bunnies that tie in to the holiday. I also think giving a book, focused on the true story and meaning of Easter is also a great idea. This year, we got our daughter a Minnie Mouse place mat to put the Easter basket on top of and she'll love eating off of it during meals. I think dishes are a great idea. We also did a Minnie Mouse sippie cup, but I also think utensils are a great idea as a basket stuffer. Whew! Her Easter Basket is still in the works, and I'll post a picture when I put it together, but I wanted to collaborate with my mommy friends on ideas. One of the things I want to accomplish with my new blog is to connect with people that are going through medically trying journeys and understand the organ transplant process. We are a community. One where we seem to "get" each other, in ways quite honestly, other people just don't. When Scott got "sick" I felt very alone. No one understood me. I was 17 weeks pregnant. We just found out, our little baby was A GIRL! And he didn't look sick. He didn't act sick. He didn't know he was that sick.....While we tried to tell friends and our colleagues our new reality, no one really understood what it was like. We were barely 30. We had just found out we were having a baby. We were still having fun as newlyweds....suddenly, we were this rare percent of the population. Who gets end stage renal disease out of the blue this young!? There wasn't anyone we could relate to. I want people like us to know, you aren't a lone. We get it. And I want people that havent gone through things so though to be a little less judgmental. A little less demanding. And quite honestly, a little better of a friend. So here is how we found out Scott was "sick." The short version. He woke up one morning with a popped blood vessel in his eye, so he went to an eye doctor. The doctor said your eye is fine, maybe it's caused by high blood pressure. He went to CVS to check his blood pressure and it was off the charts so high. So he went to a cardiologist. The cardiologist ran labs and the next day they called him and said he needed to do his labs again to make sure there wasn't error. He did them again, and not even 24 hours later, his doctor called me on my way to work and told me my husband was in kidney failure, his kidneys were functioning at about 3-5%, that I should go be with him and we would be admitted to the hospital immediately. I was STUNNED. WHAT DO YOU MEAN, I just saw him this morning and he looked completely fine. I met Scott and we went to St. Luke's Hospital in The Woodlands, TX. In comes our new Nephrologist, he said, I'm going to run a test to see if this has been going on for a while, or if it just started...that night, the nurses kept coming in Scott's room.....Drawing more blood, doing other things to him, giving him more meds....I knew something very wrong....that morning Scott's Nephrologist again was like okay, let's do a biopsy. That ended up taking what seemed like an eternity...Turns out, Scott's kidney's were so far gone- they couldn't even find them the first time they did the biopsy....so they had to do it a second time....I remember Scott's doctor coming back in and telling me "I'm not optimistic about treating the current kidneys." WHAT! I about died. Here I was 17 weeks pregnant, my husband, the love of my life, the person that completes my world go round, and you're not optimistic about treating his current kidney. I was FREAKED. Long story short, he went in to the options of a kidney transplant. Fast forward to Scott has two brothers. The first time, his middle brother was ruled out by high blood pressure. I was devastated. Being pregnant, they wouldn't let me test. I called and begged to let him re test his blood pressure and at first they said no. But I kept on them and they said his blood pressure was too high, it wouldn't change anything but sure, he can retest....turns out, he passed.....On to the blood test. I remember being in Target, Scott called, his brother, the one they ruled out initially was a 100% MATCH. I squealed to the stranger next to me. I told them "My husband is getting a kidney!!! That night I was so happy. Alllllll of my dreams, everything I had prayed for, every second of my life, came true. The next day, I go to my OB for a routine pregnancy check up on my way to work. I was just 36 weeks. They pretty much told me do not pass go, do not collect $200, do not go in to work, do not even go pack a bag. Go strait to the hospital you have preeclampsia. AGAIN I'm like WHAT! NO MY HUSBAND NEEDS ME. They said you really need to be in the hospital on bed rest....This is the very next day right after I found out my husband was getting his kidney, I went from being so happy to so upset....I wake up in the hospital a couple of days later and the doctor tells me my preeclampsia had become severe and they needed to induce me that day! Talk about a turn of events! That night, they started some meds and in the morning, the doctor walked in and said plan B, scratch the induction, you need a C Section right away and your next on the list to go in to the OR. WHATTTTTTT!!!! I mean, we didn't have one thing washed, I didn't even have a car seat installed. No crib set up. NOTHING READY AT ALL. Tiny little Aubrey Vargo Williams was born just 5.2 lbs. They actually had to use a vacuum during my C Section. It turns out it's a good thing I had her when I did, because her cord was small- she wasn't getting the nutrients she needed and her cord was wrapped around her neck 3 times. I saw her for a few minutes and they whisked her to the Level 2 NICU. She graduated from there quickly and I finally got to hold and nurse my little miracle baby. When Aubrey was just 11 weeks old, Scott got his kidney transplant. Everything went great. LifeGift organization that offers hope to individuals needing transplants in 109 Texas counties in the Houston area, North Texas and West Texas. It is a founding member of Donate Life Texas, the organization that runs the organ, eye and tissue donor registry. We had people get mad at us because we didn't call them enough, they didn't hear things from us directly, or we didn't invite them to hang out with us enough. Ummm yes! I spend 24 hours a day racking my brain on how to make things better. I've gone through 8 million pages of Google doing my own research and I've asked millions of questions. Please don't act like you have some great idea that will help. Please just stop. I'm exhausted and I'm tired of explaining myself to everyone. I've either already asked the question and I'm worn out of talking about it or I didn't ask the question and for whatever reason, I'm not going to. Scott and his brother and kidney donor Blaine, shared their story with our local 10:00 News! 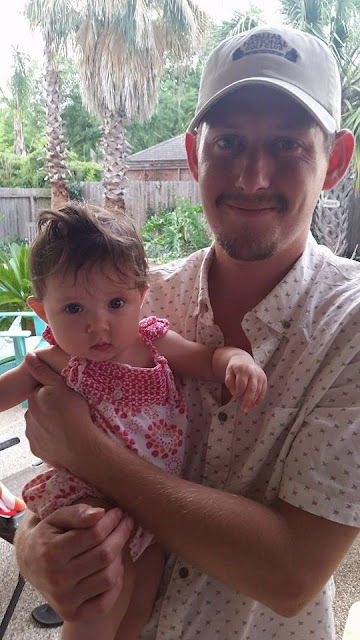 A few weekends ago, we took Aubrey to Kemah, Texas with my in-laws. As fun as the Landry's restaurants and the Boardwalk can be, I wanted to share a few ways to enjoy the water, boats, and the boardwalk without spending your life savings. There is a hidden gem in Seabrook, called Outriggers. It's a restaurant that just might be better than any restaurant on the Boardwalk. It's just was fun. It's on the water. There is live music, you watch boats pass by and boats dock up to it to eat, parking is free, and the food is delicious and reasonably priced. The Creole Crab Dip and Rum Punch are musts. We also love their fish tacos and fried shrimp. Like I dream about their food at night sometimes. Go there for lunch for sure. Then head across the way to the Boardwalk. It's $8 to park. Aubrey loves choo choo trains, so we did the train ride, I think it's about $4 or $5 a person. It's kind of relaxing too actually and lasts about 15 minutes. The Boardwalk is so well kept so it's very pretty scenery to ride through. The other attractions we passed on. It's more fun to just walk around the boardwalk. You can grab a drink and walk it too! Aubrey loved the seagulls and looking at fish. Another thing on the Boardwalk, if you want to sit down and enjoy the atmosphere without spending a fortune, they have a playground there near the Flying Dutchman. And kids can play and adults can watch them at tables right in front of it. You can grab a drink there and a snack if you'd like and just sit down without being "waited on" and enjoy the water, boats and your child having a great time. There is also a band playing there where children and adults love to dance to, as well as a water spray fountains the children play in. For the boardwalk, with the exception of the train ride, we recommend skipping the attractions and just enjoying the scenery, the play ground, the band, and the water fountains and have a great time. Easy peasy without waiting over an hour for a table with a starving toddler and so much fun for everyone. And definitely, eat across the way at Outriggers. On your way back home, if you enjoy cooking fresh seafood, nothing is better than Rosies! Grab a cooler and some ice and take some back home with you. It's right across from Outriggers.